After Wynne Chapel was built at Austin College in 1958, the Toddie Lee Wynne family of Dallas, who provided funding for the chapel, decided it needed something more. After much deliberation as to the best possible choice, an Aeolian-Skinner grand pipe organ was installed in the chapel in 1963, also with gifts from the family. The late Richard Tappa, longtime music faculty member and College organist, came to Austin College partly because of the fine quality organ. Anna Laura Page, former first lady of Austin College and an accomplished organist, said, “Because of its historical nature, we need to strive to keep this wonderful instrument in good working order. 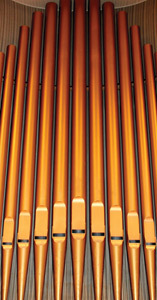 It is a spectacular instrument with incredible acoustic qualities, and I am so proud to be able to play it on occasion.” Anna Laura recalled that a few years ago, a doctoral student doing his dissertation on Aeolian-Skinner organs viewed the Wynne Chapel organ and was very excited to find it still in place and so well cared for—a tribute to the careful attention of Dr. Tappa. To produce the sounds made by a pipe organ, air must pass through the rows of pipes as keys are played.Water wheels and hand-pumped bellows are among the methods that helped blow air through the pipes before electricity, but ‘modern’ pipe organs are powered by a motor-driven fan. Air is pumped into the reservoir, which holds the air under constant pressure to produce a steady tone through the pipes. 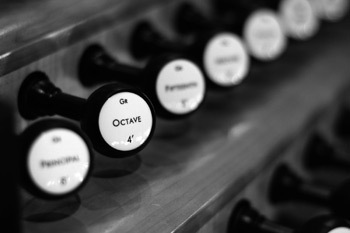 Austin College’s organ has three keyboards or manuals and a pedalboard, which the organist plays to produce the range of notes and sounds in organ compositions. 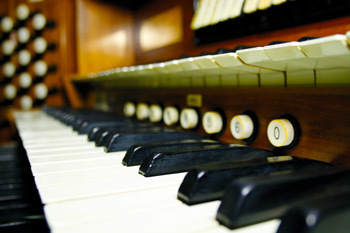 The Wynne Chapel organ, which took many months to create and install, will have been part of the campus tradition for 50 years in 2013. In honor of the organ’s 50th anniversary on campus, Austin College has initiated a “50 for 50” mini-campaign to raise $50,000 for needed organ repairs. The Opal Carlton Estate has designated a 1:1 challenge grant of $25,000 to assist in meeting the need by the time of the organ’s anniversary in 2013. Individuals wishing to make gifts toward this challenge may contact Brooks Hull, vice president for Institutional Advancement, at 903.813.2419.